I get weirded out all the time by the food here in the U.S. I already blogged about the bread here. Oh my god! I just got a strawberry exactly like that in shape and size. 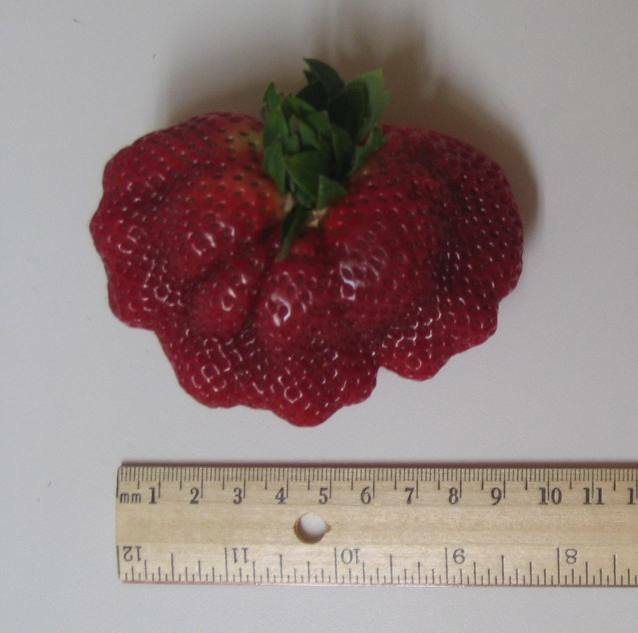 I did a google search for “mutant strawberry” and found this! Crazy! Must be all the genetic engineering. Hey, what a strange strawberry…I’ve never seen it before… Maybe that’s all because of abnormality genetics. Wonderful blog! Do you have any tips and hints for aspiring writers? I’m planning to start my own website soon but I’m a little lost on everything. Would you recommend starting with a free platform like WordPress or go for a paid option? There are so many options out there that I’m totally overwhelmed .. Any tips? Many thanks! I have to express my appreciation to you just for bailing me out of this type of situation. Just after checking through the world-wide-web and finding strategies which are not beneficial, I believed my entire life was done. Existing without the presence of solutions to the difficulties you have fixed through your entire short article is a critical case, and the ones that might have negatively affected my entire career if I hadn’t noticed your website. Your primary skills and kindness in handling all things was valuable. I don’t know what I would have done if I had not come upon such a subject like this. I can at this point look ahead to my future. Thanks for your time so much for this specialized and results-oriented guide. I won’t think twice to endorse your blog post to any individual who should receive support about this situation. Whats up! I simply want to give a huge thumbs up for the nice data you’ve here on this post. I can be coming again to your blog for more soon.